Does your municipality allow the keeping of pet pigs? 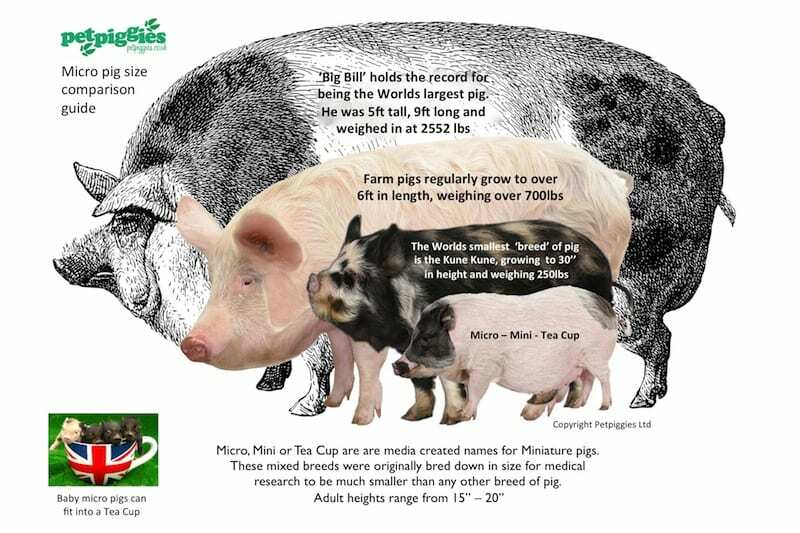 How big do mini, micro and teacup pigs really grow? What type of housing do pigs require? Are pigs compatible with other pets? What do pigs eat? What should you feed to pigs? Do you have access to suitable veterinary care in your community? Should you get a pet pig spayed or neutered? Is hoof and tusk trimming really necessary for pet pigs? How do you transport a pig? Do you know how to humanely catch a pig and get it into a vehicle? How do you potty train a pig, and what do you do with all that pig poo? What happens to unwanted pigs? 1.) Does your municipality allow the keeping of pet pigs? Keeping farm animals within city limits is against the law in many municipalities. 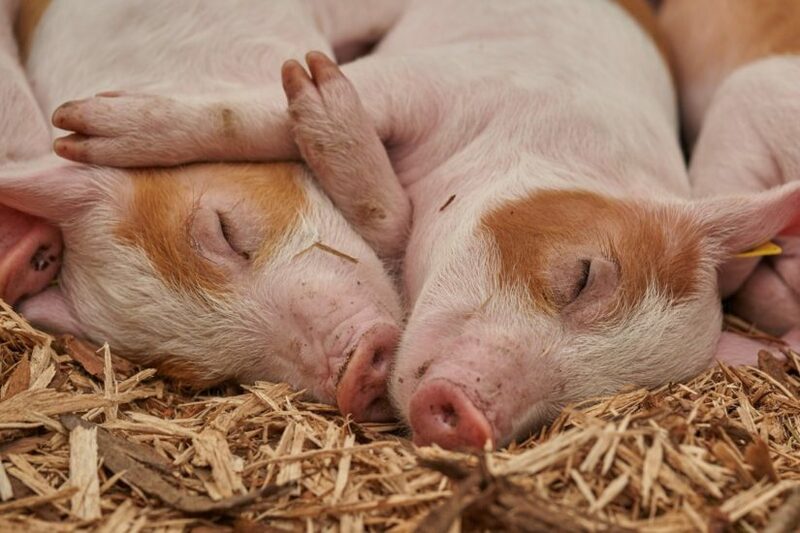 Though sold as pets, “micro-pigs” are just that – pigs. “Some people acquire pet pigs without even knowing whether they are allowed to have them where they live,” says Cant. These people are then typically faced with a choice: move house or find a new home for their pig. “Pigs are not easy to place,” she says. “People soon discover that hobby farms and rescue groups have little or no capacity to take on their poor decision.” Zoning restrictions is one of the main reasons why pet pigs end up unwanted. Are you aware you will be held accountable for the health and welfare of your pig? At minimum, you must abide by the Canadian Code of Practice for the Care and Handling of Pigs and Code of Practice for the Care and Handling of Farm Animals: Transportation. Failure to provide them with this level of care would be considered an act of cruelty and could result in fines and/or charges. 2.) How big do mini pigs really grow? Be sure to ask the age of the parents if the breeder shows you pictures, or better yet, ask to meet the parent pigs. “Sometimes breeders show people how small the parent pigs are when the parent pigs are not yet full grown themselves,” says Cant. 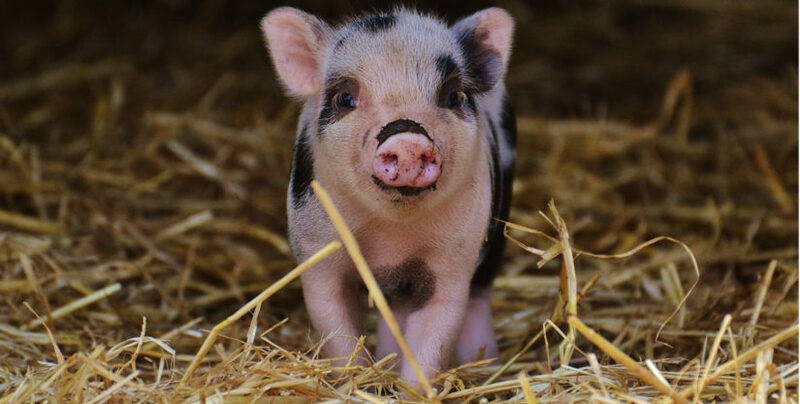 By three to six years of age, miniature pigs are fully grown. Any younger, and they probably won’t be. Despite weighing less than one or two pounds at birth, pigs grow very large. A 100-pound potbellied pig can be the height of a small dog that weighs only 35-40 pounds. Once full grown, a “miniature” potbellied pig can weigh up to 250 pounds and not be overweight. These pigs will be about knee-height to the average adult human. If your teacup or micro pig is actually a standard farm-breed pig, it will grow even heavier and up to three times as tall. Mature females can be over 700 pounds and males even larger: possibly over 1,000 pounds! The largest pig ever recorded was named ‘Big Bill’, and he weighed 2,552 pounds. He was five feet tall and nine feet long. “Be aware that whatever you adopt, it will never fit inside a teacup,” says Cant. In an expose, Inside Edition goes undercover to see how teacup pig breeders con people into buying their piglets. 3.) Some aspects of the urban environment are not compatible with keeping pet pigs. What type of housing do pigs require? Pet pigs have similar welfare considerations to those raised on farms. 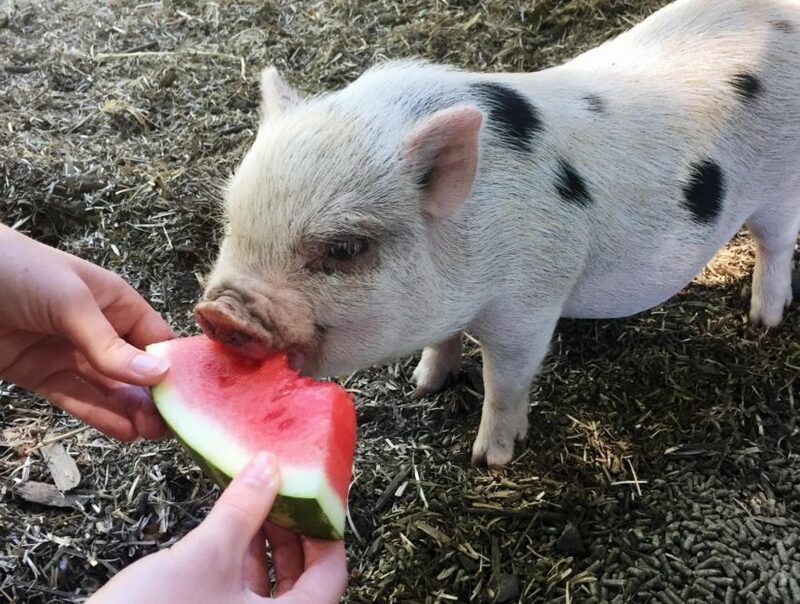 “Some people expect pet pigs to behave just like dogs,” says Brandy Street, a pig behaviour expert at the BC SPCA. While, in some ways, pigs are similar to dogs – they can be house-trained, for instance – they have other needs that are difficult to meet in a home setting. “Pigs need an environment that allows them to root around, explore and manipulate objects meant for pigs. Average dog toys will be destroyed and consumed in no time, which can be dangerous for the pig’s health and means anything else in your house becomes fair game,” says Street. Suitable pig toys include anything that is manipulatable but not easily destructible, safe if consumed, and provides a challenge or results in a reward (e.g. a food treat) when the pig plays with it. “Pigs can quickly become bored, and bored pigs tend to make trouble,” says Street. Without opportunities to perform normal pig behaviours, like nosing around outside in the dirt, pigs will create their own opportunities in the house, often by rooting through cupboards, tearing apart couches and knocking over tables. They are very strong. 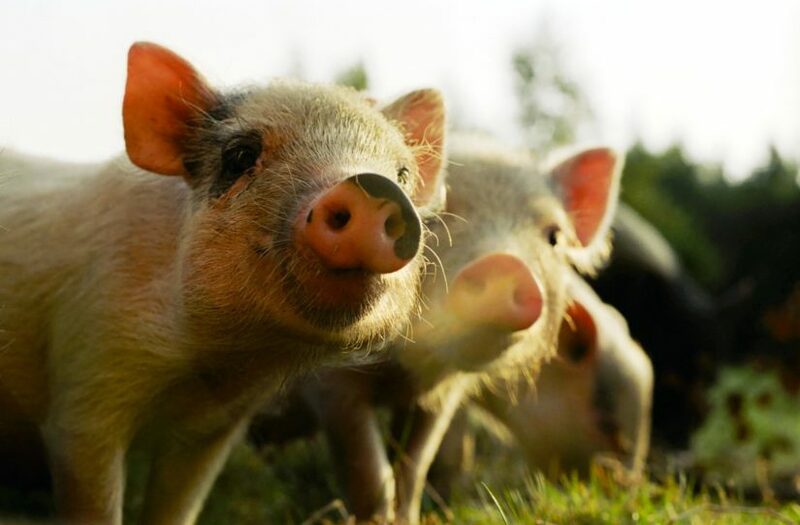 Pigs are best suited to an outdoor environment that provides them with lots of space to carry out these activities without permanently destroying the ground. Outdoors, you will need to provide them with shelter, as pigs are susceptible to cold and hot temperature extremes. A wallow (i.e. a shallow mud pit) is also beneficial, as it cools them off on hot days and acts as an insect repellant and sun screen. Many people are unaware that pigs don’t sweat, they are prone to insect bites and parasites, and they can get sunburnt. A wallow acts as a preventative measure as well as a skin conditioner for pigs, who are prone to dry, flaky skin. Bedding (for warmth and comfort) can be expensive, so you will have to consider that as an added cost. Keep in mind, pigs will try to consume pretty much anything, whether it’s straw or your grandma’s knitted blanket, so be cautious what you provide to them. On farms, straw, sawdust or untreated wood shavings are most commonly used as bedding. If you’re in a rural area or close to a park, forested area, or natural habitat, you will also need to consider protecting your pig from predators like coyotes, wolves, big cats or bears, to name a few. Depending on the location of your home and the wildlife in your area, you may need to invest in high-quality predator-proof fencing. One final thought to consider is how your pig will be housed and cared for while you are away from your home for extended periods of time. There are very few pig kennels (if any) to choose from, and you probably don’t want to risk sending your pig to a farm for temporary care in case it catches an illness from another pig. Do you know someone you can trust with the care of your pig while you are away from home? 4.) Are pigs compatible with other pets? As with any pet, pigs may or may not get along with other animals in the household. In general, pigs and cats tend to live peacefully together. Dogs and pigs, on the other hand, are an unpredictable combination, mainly because dogs are a large predator species and pigs are naturally a prey species. This may lead to unwanted bullying of your pet pig. “Dogs have been known to attack pigs – even ones they have lived with for a while,” says Cant. “Pigs can also behave aggressively towards dogs, especially when food is involved.” Interactions between the two should always be supervised. Though pigs may not get along with other pets, Cant notes that they are very social animals and, ideally, should be kept with other pigs for company. Pigs are omnivores and need a balance of vitamins, minerals, proteins, fibres and carbohydrates, but you won’t find pig feed in the local pet store very easily, and commercial feed manufacturing companies typically sell in bulk to farmers. Pigs have been known to eat human food scraps and leftovers, but this is not ideal as it is not guaranteed to meet all of their nutritional needs. Also, some human foods are not appropriate for a pet pig, and consumption of spoiled food can make pigs sick just like it can make people sick. Dog and cat foods are NOT a good alternative to a quality feed formulated specifically for pigs. Pigs should always have access to water, and should be fed at least two or three times per day. Potbellied pigs consume a few pounds of food per day, but if your teacup pig turns out to be a farm-breed pig, you can expect it to consume as much as four to seven pounds of food per day while it’s growing. “Some websites instruct people to feed their pig a quarter cup of food a day to keep it small, but the skeletal size of a pig is directly related to its genetic makeup and not to the amount of food it eats. If people feed them that little, they’d essentially be starving their pig, which could lead to malformed bones, poor hair coat and inadequate brain development, not to mention death,” says Street. Pigs are very vocal. When they are hungry, they will let you (and all your neighbours) know. If you feed pigs outdoors, you will need to consider how to protect their food from dogs and cats roaming the neighbourhood, rodents and other wildlife (e.g. mink, coyotes, raccoons, birds, skunks). 6.) Do you have access to suitable veterinary care in your community? Pigs may live for up to 15 years. During that time you will need to plan for vet visits just like you would with other pets or farm animals. Because they are prey animals, sometimes pigs try to hide the fact that they are sick or injured. Do you have the knowledge or skills necessary to recognize common symptoms of disease, injury or infection in your pet pig? Do you know an experienced vet who will be willing to come out to your place to treat your pig? Pigs require vaccinations and are susceptible to a number of illnesses that humans also get, such as the flu. It is very unlikely a pet clinic will accept pigs. It is best to discuss a vaccination plan with a working swine veterinarian. What about if your pig becomes too sick to get better? 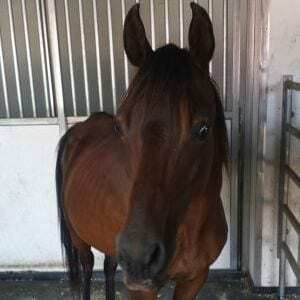 Will you take it to the vet for humane euthanasia? It is unlikely a slaughter plant would take your pig, if that is even a remote consideration for you. 7.) Should you get a pet pig spayed or neutered? Mature, intact boars (i.e. male pigs) grow very large and can be aggressive. Therefore, male pigs should be neutered (castrated) as early as possible while they are small, easy to handle and will heal quickly. The procedure should only be done by an experienced veterinarian using pain medication. Spaying female pigs is not very common, so you may find it difficult to locate a vet who is willing to perform the procedure. Depending on the breed, pigs may become sexually mature as early as three to four months of age. They are prolific breeders, so if you adopt a male and female together, you will definitely want to consider having the male castrated or you may end up with a litter of 12 or so piglets in about three months’ time. The gestation period for pigs is three months, three weeks and three days, or about 115 days. 8.) Is hoof and tusk trimming really necessary for pet pigs? “Both male and female pigs will grow tusks, which can pose a danger to humans whether the pig is aggressive or just being a pig,” says Street. On farms, tusks are clipped off at birth, although the procedure can cause lasting pain and is being phased out of common practice. Pigs have cloven (two-toed) hooves. On a farm, pigs’ hooves rarely need trimming because the environment typically provides enough wear. However, inside a home, hooves may not get this same wear and tear. Veterinary visits may be required for upkeep to prevent hooves from becoming painfully overgrown. 9.) How do you transport a pig? Do you know how to humanely catch a pig and get it into a vehicle? Pigs, like humans, are susceptible to motion sickness and may become nauseous in a moving vehicle. Do you have a vehicle big enough to safely transport your pig, keeping in mind it may get dirty during the trip? Remember, at minimum, you must abide by the Canadian Code of Practice for the Care and Handling of Farm Animals: Transportation. Transporting a pig in the trunk of a car or the back of a pickup truck would be unsafe, as would allowing the pig to move about freely inside a moving vehicle. 10.) How do you potty train a pig, and what do you do with all that pig poo? When fed a diet that meets their nutritional needs, pig manure applied to soil as a composted or raw product can be beneficial. However, it is important to keep in mind that manure is a waste product much like sewage that needs to be managed properly to avoid overloading soil nutrients and potentially contaminating waterways. Pig manure is also one of the most aversive smells compared with other forms of livestock manure. In other words, expect a few complaints from the next door neighbours when you spread Percy’s manure in the garden. Note: This list is not exhaustive. Other costs not listed here may be incurred as well. 12) What happens to unwanted pigs? In the end, like so many fad pets before them, it is the pigs who pay the price for their popularity. Well-intentioned but poorly-informed caregivers become overwhelmed and, as a result, many pet pigs are relinquished to shelters, rescues and hobby farms. However, pet pigs can be very hard to rehome, as these groups often have little or no capacity to take in unwanted pigs. You may be left facing euthanasia by a vet or sending your pig to slaughter if the processing plant will even accept your pig. For more information on this issue, you can contact your local community council or email the BC SPCA. 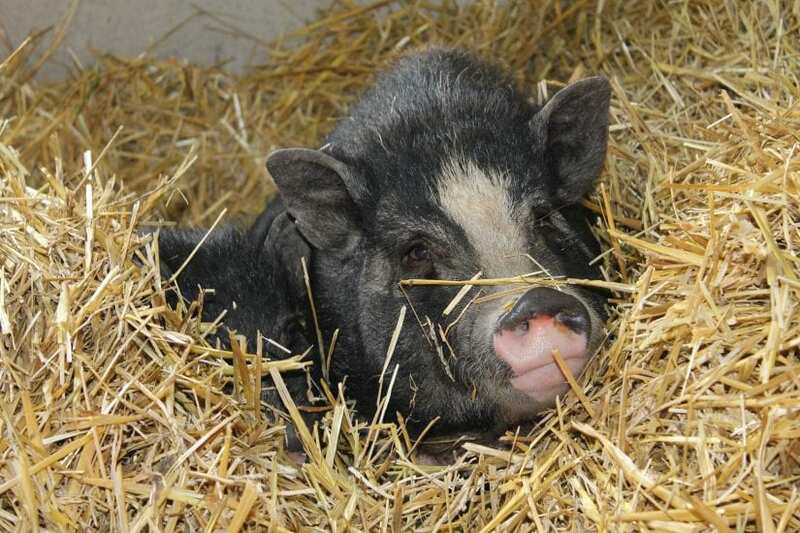 To adopt a pig from the BC SPCA, search our online database of adoptable animals.